"Waiting on Wednesday" is a weekly event held by Jill at Breaking the Spine so we can spotlight upcoming releases we're anticipating. 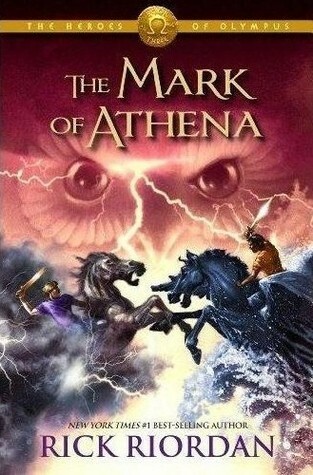 The book I can't wait for is Mark of Athena by Rick Riordan, which is coming out on October 2, 2012. Annabeth is terrified. Just when she’s about to be reunited with Percy—after six months of being apart, thanks to Hera—it looks like Camp Jupiter is preparing for war. As Annabeth and her friends Jason, Piper, and Leo fly in on the Argo II, she can’t blame the Roman demigods for thinking the ship is a Greek weapon. With its steaming bronze dragon masthead, Leo’s fantastical creation doesn’t appear friendly. Annabeth hopes that the sight of their praetor Jason on deck will reassure the Romans that the visitors from Camp Half-Blood are coming in peace. And that’s only one of her worries. In her pocket Annabeth carries a gift from her mother that came with an unnerving demand: Follow the Mark of Athena. Avenge me. Annabeth already feels weighed down by the prophecy that will send seven demigods on a quest to find—and close— the Doors of Death. What more does Athena want from her? Annabeth’s biggest fear, though, is that Percy might have changed. What if he’s now attached to Roman ways? Does he still need his old friends? As the daughter of the goddess of war and wisdom, Annabeth knows she was born to be a leader, but never again does she want to be without Seaweed Brain by her side. Narrated by four different demigods, The Mark of Athena is an unforgettable journey across land and sea to Rome, where important discoveries, surprising sacrifices, and unspeakable horrors await. Climb aboard the Argo II, if you dare. . . . I love Rick Riordan! I only read the first book in this series so I need to catch up before I can be waiting with you! I'm looking forward to this one too! He just released his tour dates, but doesn't come anywhere close to me :( but it's going to be great just the same! Sounds like a good choice, enjoy! I really need to read his books! I've got the box set for the Percy Jackson books and am dying to start this series! Need more time! Great pick! Thanks for sharing :) Loving the Timeless cover, chicky! Wow! I have seen this one around a lot lately. I can understand why though. It's Riordan...what's not to love. Ooo great pick! I picked Timeless for my WoW! :) So excited.